Buy Palladium: Palladium Winning Over Gold Price! I just thought I'd make another quick note of the gold market and movements of other precious metals over the past week or so. Around the time of the announcement of the GM bankruptcy gold and silver bullion really started moving up. Then, platinum and palladium--more industrial than silver or gold--followed. 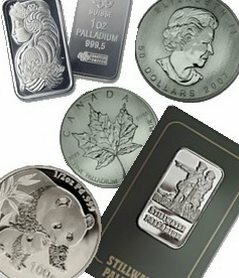 Below are the prices of gold rounds, silver rounds, palladium rounds, platinum rounds, and rhodium rounds. Column 1 shows the June 1st morning price and column 2 shows the June 2nd evening price. Today it's June 6th. Let's look how the methods outlined in Fail-Proof Plan to Create Wealth (Gold & Silver vs Platinum & Palladium) would have worked if we were buying and selling precious metals this week. The image below shoes the June 6th prices. Do you see how gold rose and silver quickly followed? Do you see how palladium and platinum coins lagged behind gold and silver? Do you think you'd be able to think of an investment strategy to actually make money from this knowledge of price movements? You're a smart person, smart enough to be reading this and at least trying to think about your future, so that shows more action that 99% of the people are willing to take already. Think about the people you know. What do they do? I'll take a guess. They go to work, get money to buy the necessities and a luxury item or two, get drunk or go up north on the weekends, then go back to work on Monday. You are different. And we have to work together to find more and more ways to increase our wealth to be able to live the lives we desire. Check back in about 2-3 days for part two of our popular Fail-Proof Plan to Create Wealth article.